NYMTC regularly holds public meetings and events to keep the public informed and involved in regional transportation planning activities. Meetings are held as a regular course of the planning process. Public involvement is critical to ensuring that future transportation investments reflect the needs, interests and concerns of those who are most affected. In addition to in-person participation opportunities, most meetings are also offered as webinars or via webcast. NEW YORK - New York City Transportation Commissioner Polly Trottenberg was confirmed as Co-Chair of the New York Metropolitan Transportation Council (NYMTC) at its 2019 Annual Meeting. During the March 6, 2019 meeting, which was held at the CUNY Graduate Center, NYMTC Council Members elected Commissioner Trottenberg as Co-Chair for the 2019- 2020 term. Previously, Nassau County Executive Laura Curran served as NYMTC’s Co-Chair. County Executive Curran was recognized by the NYMTC Board at the meeting for her service. The New York State Department of Transportation Commissioner is NYMTC’s permanent Co-Chair. Additionally, NYMTC announced the release of its 2019 Annual Report, which is titled “The Future of Mobility.” To obtain a copy of NYMTC’s 2019 Annual Report, please click here. “This year’s Annual Meeting and Annual Report focus on technology-driven changes in transportation including ride-sharing, e-commerce, the potential for automated and connected vehicles, and more emphasis on multimodal travel options,” said NYMTC Executive Director José M. Rivera. Also, serving as the Annual Meeting’s keynote speaker, Shailen P. Bhatt, President and CEO of ITS America, offered a special presentation titled “How New Mobility Technologies are Transforming the Movement of People, Data, and Freight.” Mr. Bhatt discussed Mobility on Demand (MOD) opportunities in the NYMTC region that have the potential to help make it easier for travelers to choose the transportation option that makes sense for them and that is also reliable, sustainable, and safe. “To fully realize the benefits of MOD, it should foster an increased use of New York’s great public transportation system as well as support the use of other modes to help address transit deserts and move travelers from their starting points to their destinations,” said Bhatt. Council Members also adopted NYMTC’s SFY 2019-2020 Unified Planning Work Program (UPWP). The UPWP is a guiding document that helps NYMTC and its members to determine how federal funding will be spent each year for planning activities. “The $44.4 million Unified Planning Work Program continues to address many of the region’s planning needs and priorities,” said NYMTC Executive Director Rivera. Click here to view the meeting: NYMTC’s YouTube page. NEW YORK - The New York Metropolitan Transportation Council (NYMTC) hosted a quarterly meeting of its Metropolitan Mobility Network on January 30, 2019 at its offices in Lower Manhattan. The Network, which was originally created in the late 1990s has been reestablished with a specific focus on Transportation Systems Management and Operations (TSMO) which is an integrated program to optimize the performance of existing multimodal infrastructure by implementing systems, services, and projects to maximize capacity and improve the security, safety, and reliability of the transportation system. NYMTC is the metropolitan planning organization (MPO) for New York City, Long Island, and the lower Hudson Valley. The meeting featured presentations regarding current TSMO activities and developments that can impact TSMO going forward. Solomon Caviness, North Jersey Transportation Planning Authority, presented on the North Jersey Intelligent Transportation Systems (ITS) Advancement Project. Raj Amin and Patrick Chan, New York State Department of Transportation, presented on the NYC Intelligent Transportation Systems (ITS) Architecture Update. Jim Davis, New York State Department of Transportation (NYSDOT), presented on the NYSDOT Statewide TSMO Program. Ankita Rathi, Suffolk County Economic Development and Planning, presented on the Suffolk County Mobility Study. The Metropolitan Mobility Network consists of the staffs and member agency staffs of NYMTC and the Metropolitan Area Planning (MAP) Forum member MPOs and Councils of Government (COGs) that are involved in TSMO. Additional photos are available on NYMTC’s Flickr Page. WHITE PLAINS - The New York Metropolitan Transportation Council’s (NYMTC) Mid-Hudson South Transportation Coordinating Committee held a Lower Hudson Valley Mobility Advisory Forum at the Westchester County Center in White Plains on Tuesday, December 11, 2018. The Forum focused on Mobility Improvements in the Hudson Valley and featured two presentations followed by a discussion of the Future of Mobility. The first presentation, delivered by Naomi Klein and Craig Lader from the Westchester County Department of Public Works and Transportation, showcased the First-and-Last Mile Connections TNC Partnership Study. The second presentation, delivered by Eva Hsu, a consultant representing the New York State Department of Transportation, highlighted recent changes to the 511NY Rideshare Program. The study conducted by Westchester County focused on Transportation Network Companies (TNCs) and how they might be able to complement existing transit service, addressing first and last mile connections and gaps in the transportation network. A TNC is an entity that exclusively uses a digital network to connect drivers and passengers, for example Lyft and Uber. The team investigated eight case studies from across the US to determine lessons learned and identify potential models for Westchester County. The 511NY Rideshare Program presentation explained key aspects of the program. The speaker introduced the new Guaranteed Ride Program and discussed how it complements the other aspects of the Rideshare Program. For those considering becoming a member, the simplicity of joining was reviewed. The discussion of the Future of Mobility highlighted the need to anticipate changes in the coming decades. Participants considered changes in both personal mobility and goods movement. Automation and the continued move toward shared mobility were key themes throughout the discussion. NEW YORK - As part of the New York Metropolitan Transportation Council (NYMTC’s) Regional Trends Series, NYMTC hosted a presentation by Darnell Tyson, Acting Commissioner of the Suffolk County Department of Public Works, on January 17th, 2019. Audience members at NYMTC’s office in lower Manhattan, as well as those participating via webinar learned about two studies focused on Bus Rapid Transit (BRT) in Suffolk County. Mr. Tyson’s presentation entitled “Bus Rapid Transit Design and Planning in Suffolk County” focused on developing public transit connections to increase mobility using the proposed Nicolls Road and Route 110 BRT Corridors. The Nicolls Road BRT Corridor is being developed as an Innovation Zone (I-Zone) multimodal corridor that includes a BRT route, and hiking and biking trail. The Route 110 BRT corridor will improve connections to large employers and multiple branches of the Long Island Rail Road by building from an existing bus ridership. The Suffolk County BRT studies are a component of Connect Long Island, Suffolk County’s regional transportation and development plan to create sustainable economic growth through investments in housing, transportation, and innovation. NYMTC’s Regional Trends Series provides the public with access to key industry leaders and offers information about trends and developments that are shaping the future of the transportation system. Click here to view photos of the meeting: NYMTC’s Flickr Page. NEW YORK - As part of the New York Metropolitan Transportation Council’s (NYMTC’s) Regional Trends Series, NYMTC hosted a presentation by Caleb Stratton, Chief Resiliency Officer for the City of Hoboken. Audience members at NYMTC’s office in lower Manhattan, as well as those participating via webinar learned about the City of Hoboken’s efforts to increase resiliency to the impacts of extreme weather and climate risks. Mr. Stratton’s presentation titled “Resiliency in Action” focused on the $230 Million Rebuild by Design “Resist, Delay, Store, Discharge” comprehensive urban water management strategy as well as the development of municipal energy microgrid. These efforts are shaping the direction of Hoboken’s resiliency initiatives to ensure they create a more responsive system. NEW YORK - A delegation from the People’s Republic of China, Henan Province, visited NYMTC on December 3, 2018. Consisting of provincial, county and other local officials, the delegation had been in the United States visiting with transportation officials and exploring approaches to infrastructure expansion and regional coordination. During their session with NYMTC Executive Director Jose Rivera and other senior NYMTC staff managers, members of the delegation inquired about coordination mechanisms across the multi-state metropolitan region surrounding New York City, both for transportation infrastructure and for land use development. They also asked about the federal funding process and how regional plans translated into actual projects. The officials in the delegation hailed from a rapidly growing Chinese province and were working to accommodate sharp increases in travel and goods movement, as well as evolving travel patterns. NEW YORK - At the November 15th, 2018 meeting of the Program, Finance and Administration Committee (PFAC) of the New York Metropolitan Transportation Council (NYMTC), two presentations were made to the Committee and members of the public. Julia Kite-Laidlaw, Director of Strategic Initiatives for the New York City Department of Transportation presented “Vision Zero in New York City: Progress and Strategies” which reviewed the City’s multi- agency strategy, led by the New York City Department of Transportation, to eliminate all traffic fatalities and severe injuries, while increasing safe, healthy, equitable mobility for all. A combination of enforcement, engineering, and education has significantly eliminated deaths and injuries to drivers and pedestrians in traffic crashes. Carolyn Grossman, Regional Planning Director for the New York City Department of City Planning presented “The Geography of Jobs.” a New York City metro region economic snapshot, and reported on the interconnected redistribution of economic and population growth near and around the inner urban core of the region. Upcoming Meeting: NYMTC’s next Program, Finance and Administration Committee Meeting is scheduled for Thursday, February 14, 2019. NEW YORK The New York Metropolitan Transportation Council (NYMTC) relaunched its Metropolitan Mobility Network by hosting a meeting of its members on September 26, 2018 at its offices in Lower Manhattan. The Network, which was originally created in the late 1990s is being reestablished with a specific focus on Transportation Systems Management and Operations (TSMO). NYMTC is the Metropolitan Planning Organization (MPO) for New York City, Long Island, and the lower Hudson Valley. The meeting featured a number of presentations regarding current TSMO activities and developments that can impact TSMO going forward. Gerry Bogacz, Director of Planning at NYMTC, presented on the Transformational Change and Transportation System Management & Operations (TSMO). Rosemary Mascali, Manager at Transit Solutions, presented on the Impact of Tax Reform on the Commuter Benefit. Kirk Hovenkotter, Program Associate at Transit Center, presented on the Development of Microtransit. Andrew Weeks, Director of Modeling and Data Analysis at the New York City Department of Transportation, presented on ICM Concept of Operations Study for the I-495 Corridor in the New York Metropolitan Region. Naomi Klein, Director of Planning at the Westchester County Department of Public Works and Transportation, presented on the Westchester County Bee-Line System First and Last Mile Connections Mobility Study. NEW YORK - “Today we learned more about NYC’s efforts to reduce over-reliance on trucks for freight distribution. FreightNYC lays out a $100 million multi-modal investment strategy to support increased freight distribution by rail, maritime, and cleaner trucks,” said NYMTC Executive Director Jose M. Rivera. Upcoming Meeting: NYMTC’s next Program, Finance and Administration Committee Meeting is scheduled for Thursday, October 18th, 2018. NEW YORK -On August 9, 2018, Members of the New York Metropolitan Transportation Council’s (NYMTC) Program, Finance and Administration Committee (PFAC) adopted an amendment to add the remainder of the Hudson Tunnel Project to the fiscally-constrained element of Plan 2045. “PFAC adopted a portion of this important project as an amendment to its Plan 2045 at the April 12, 2018 meeting. This amendment allows the balance of the Hudson Tunnel Project to be included in the constrained portion of the plan,” said NYMTC Executive Director José M. Rivera. PFAC Members heard remarks from the project sponsor, the Port Authority of New York & New Jersey. R. J. Palladino, of NJ TRANSIT, presented on the NJ TRANSIT-led environmental review phase of the project. Rehabilitation of the existing NEC tunnel beneath the Hudson River, known as the North River Tunnel, following completion of the new tunnel. When the rehabilitation is complete, both the existing and new tunnels will provide redundant capacity and increased operational flexibility for Amtrak and NJ TRANSIT. Plan 2045 includes programmed projects that are in the Plan’s fiscally-constrained element and aspirational projects, proposals and studies that are in the Plan’s vision element. The vision element of the Plan includes projects that are conceptual. NEW YORK -The New York City Department of City Planning (DCP) offered a special presentation at the New York Metropolitan Transportation Council (NYMTC) regarding the recently approved Jerome Avenue Neighborhood Plan. As part of NYMTC’s Regional Trends Series, Bronx Neighborhood Studies Manager Michael Parkinson and Conor Clarke, DCP’s Transportation Project Manager, discussed the agency’s holistic approach to neighborhood planning and presented outcomes of the planning process. These included transportation recommendations and recently adopted changes to zoning within a variety of neighborhoods in the southwest Bronx. The Jerome Avenue Neighborhood Plan was approved by the New York City Council on March 22. Looking at current and future community needs, the Jerome Avenue Neighborhood Planning Study encompassed a two-mile stretch of Jerome Avenue, as well as the surrounding neighborhoods. The study was partly funded through NYMTC’s Unified Planning Work Program (UPWP). Serving as NYMTC’s budget, it is the guiding document that helps NYMTC determine how federal funding will be spent each year for transportation-related planning activities. NEW YORK - Members of the New York Metropolitan Transportation Council’s (NYMTC) Program, Finance and Administration Committee (PFAC) adopted amendments to Plan 2045 and the State Fiscal Year 2017-2018 Unified Planning Work Program (UPWP). At the April 12 meeting, PFAC Members approved amendments to the constrained element Plan 2045 – NYMTC’s current Regional Transportation Plan – to include the Hudson Yards Concrete Casing Section 3 Project. Plan 2045 includes programmed projects that are in the Plan’s fiscally-constrained element and aspirational projects, proposals and studies that are in the Plan’s vision element. The vision element of the Plan includes projects that are conceptual. Also, following a presentation by Gerry Bogacz, NYMTC’s Planning Group Director, the Committee voted to include amendments to this year’s UPWP for the Route 59 Transportation and Land Use Study in Rockland County. Previously, the Council adopted the $41.5 million UPWP at NYMTC’s Annual Meeting. Serving as NYMTC’s budget, it is the guiding document that helps NYMTC and its members to determine how federal funding will be spent this year for planning activities. NEW YORK - Matthew W. Daus, Esq., former Commissioner and Chair of the New York City Taxi and Limousine Commission (TLC), offered a special presentation at the New York Metropolitan Transportation Council (NYMTC) regarding the future of transportation technology, as it relates to big data, autonomous mobility and the law. Mr. Daus – a transportation technology lawyer, Distinguished Lecturer at the City College of New York’s University Transportation Research Center (UTRC) and President of the International Association of Transportation Regulators – discussed the evolving laws and regulations impacting transportation data and privacy, including access to data (transportation network companies, taxis, paratransit, airports) by the public, government, academia and competing private company interests. As part of NYMTC’s Regional Trends Series, Mr. Daus addressed the legal and policy issues being researched internationally, and led an interactive discussion on the future of the for-hire ground transportation industry as autonomous and connected vehicle technology progresses daily. NYMTC’s Regional Trends Series provides the public with access to key industry leaders and offers information about trends and developments that are shaping the future of the transportation system. The views and opinions expressed in these discussions are those of the presenter and do not necessarily reflect the official policy or position of NYMTC. Click here to view the meeting: NYMTC's YouTube page. NEW YORK - More than 75 percent of the 7.8 million people who entered and exited Manhattan’s Central Business District (CBD) – on an average fall weekday in 2016 – utilized public transportation, according to new data from the New York Metropolitan Transportation Council (NYMTC). NYMTC’s newly released Hub Bound Travel Data Report highlights that nearly six million people boarded public transportation to enter and leave the CBD on an average October business day, while 1.82 million used cars, taxis, vans or trucks – a 60,000 drop from the prior year (see Figure 1). The total persons whom entered and left the CBD by automobile did so through the 60th Street sector (819,535). On an annual basis, NYMTC partners with 15 state, city and county agencies, transportation authorities as well as private transportation organizations to collect data that represent a typical travel day in-and-out of New York City’s CBD. The CBD or the “Hub” includes the lower portion of Manhattan from the northern boundary of 60th Street to the southern boundary of Battery Park. In NYMTC’s Hub Bound Travel Data Report, data for persons traveling by means of public transportation, motor vehicle, and bicycle were tracked on an average fall weekday in October 2016. During this time period, 622,719 of the total 1.4 million cars, taxis, vans and trucks entering and leaving the Hub utilized the 60th Street sector. Meanwhile, nearly 353,000 vehicles passed through Brooklyn Sector; 244,000 used the Queens Sector and 184,000 vehicles utilized the New Jersey sector to enter and exit the CBD, according to NYMTC’s Hub Bound Travel Report (See map for crossing type). Highlighting the public’s preference for public transportation in the CBD, the Metropolitan Transportation Authority’s New York City Transit accounted for 82 percent of total rail service entering and leaving the CBD. Also, 84 percent of total express bus passengers entered the Hub from New Jersey. Additionally, bike riding increased by almost 170 percent over the past decade, reaching about 32,000 bicyclists entering the Hub in 2016. Meanwhile, ferry service became more of a favorite for many, as there was a 13% increase in ferry ridership from the prior year to 123,000 (see Figure 1). With this large influx of individuals entering and exiting the CBD, a number that is comparable to the total population of New York City, peak travel times, such as rush hour before and after work, are the most jammed and overcrowded. For instance, more than a third of the 3.9 million people that entered Manhattan’s CBD did so during the morning rush from 7:00 a.m. to 10:00 a.m. The most congested hour for travel was 8:00 a.m. to 9:00 a.m., when nearly 626,000 people traveled into the CBD (see Figure 2). The first travel survey of the Manhattan’s CBD was conducted and published by the Regional Plan Association (RPA) in 1924. The report referred to the district as the “Hub,” reflecting the CBD’s unique role in the region’s economy. Subsequent surveys were conducted at eight-year intervals until 1963, when the Tri-State Regional Planning Commission (NYMTC’s predecessor) assumed responsibility for the project, publishing it annually beginning in 1971. Since its inception in 1982, NYMTC has sponsored the project and published the annual report. For more information, please view the Hub Bound Travel Data Report here. NEW YORK - During its first meeting of 2018, members of the New York Metropolitan Transportation Council’s (NYMTC) Program, Finance and Administration Committee (PFAC) heard a special presentation from New York City Department of Transportation (NYC DOT) Deputy Commissioner for Policy Michael Replogle regarding New York City’s NYCx Climate Action Challenge. Focused on electric vehicle infrastructure and charging stations, as well as New York City’s climate goals, Deputy Commissioner Replogle noted to PFAC members during their January 18 meeting that this new effort involves a collaborative effort in working with civic, industry and tech experts to develop new technologies and reduce greenhouse gases. The NYCx Climate Action Challenge calls on the industry to develop and deliver electric vehicle charging hub solutions and accelerate the use of electric vehicles citywide. NYC DOT, the Mayor’s Office of the Chief Technology Officer, the Mayor’s Office of Sustainability and New York City’s Department of Citywide Administrative Services (DCAS) are leading this effort to replace all gas-powered vehicles in New York City. “We are calling on the tech industry to develop and deliver creative solutions to scale EV [electric vehicle] charging hubs and to scale the use of EVs [electric vehicles] citywide,” Deputy Commissioner Replogle added. While the challenge concluded its expression of interest on January 15, interested parties can apply until February 16 – with finalists and winners being announced this spring. “We know that there is more that we can do,” said Deputy Commissioner Replogle. Additionally, the Committee decided to recommend the draft State Fiscal Year (SFY) 2018-2019 Unified Planning Work Program for Council adoption. The UPWP is a guiding document that helps NYMTC and its members to determine how federal funding will be spent each year for planning activities. Also, PFAC recommended projects for funding through the Section 5310 Program – otherwise known as the Enhanced Mobility of Seniors and Individuals with Disabilities Public Transportation grants program. “NYMTC is happy help and assist its member agencies – who are based in New York City, Long Island and the lower Hudson Valley – in gaining access to funding to improve accessibility and mobility for seniors and persons with disabilities,” said NYMTC Executive Director Rivera. Amendments to the State Fiscal Year (SFY) 2017‐2018 Unified Planning Work Program (UPWP). Upcoming Meeting: NYMTC’s Annual Meeting is scheduled for Thursday, February 27 at 11:15 a.m.
NEW YORK - The Metropolitan Area Planning (MAP) Forum, a consortium of metropolitan planning organizations (MPOs) in the New York-New Jersey-Connecticut-Pennsylvania region, held its 2017 Annual Meeting on December 7 at the New York Metropolitan Transportation Council (NYMTC). Members of the MAP Forum discussed recent regional transportation and planning developments, including transportation performance management, the Post-Hurricane Sandy Transportation Resiliency Study, Cross-Harbor goods movement, the Hudson Tunnel project, the Lincoln Tunnel Helix and Express Bus Lane and the Port Authority Bus Terminal. Also, details were provided on new Regional Transportation Plans for both New York and northern New Jersey. "NYMTC is pleased to host this year’s Annual Meeting of the MAP Forum. It’s truly an honor to discuss, collaborate and share information,” said NYMTC Executive Director José M. Rivera. "As MPOs and regional councils of government, we plan and invest today to make sure our regional transportation system is better equipped for tomorrow." The widely-attended meeting featured presentations (accessible below) by NYMTC, the New Jersey Transportation Planning Authority (NJTPA) and Cambridge Systematics. Also, there was a roundtable discussion on Trans-Hudson Studies/Projects that featured New Jersey Transit, the Port Authority of New York and New Jersey and the Federal Railroad Administration (FRA). Mary Ameen, Deputy Executive Director at NJTPA, discussed the MAP Forum’s expanded Memorandum of Understanding and new membership. Keith Miller, Principal Planner at NJTPA, offered a presentation on Transportation Performance Management Urbanized Area Coordination. Brian ten Siethoff, Cambridge Systematics, presented the Federal Highway Administration’s Post-Hurricane Sandy Transportation Resilience Study in New York, New Jersey, and Connecticut. Jan Khan, Manager of Regional Planning at NYMTC, provided a presentation on NYMTC’s New Regional Transportation Plan – Plan 2045. Lois Goldman, Director of Regional Planning at NJTPA, provided details on NJTPA’s Plan 2045: Connecting North Jersey. Gerry Bogacz, Director of Planning at NYMTC, discussed common themes among the Regional Transportation Plans for both NYMTC and NJTPA. The Lower Connecticut River Valley Council of Governments (Connecticut). NEW YORK -During its November 16 meeting, members of the New York Metropolitan Transportation Council’s (NYMTC) Program, Finance and Administration Committee (PFAC) acted on resolutions related to the Metropolitan Planning Organization’s (MPO) regional transportation planning products. Additionally, NYMTC Executive Director José M. Rivera highlighted key achievements for the MPO, as it has a new federally adopted Regional Transportation Plan in 2017. NYMTC has also continued to work together with its members to maintain and administer the Transportation Improvement Program (TIP) for Federal Fiscal Years 2017-2021. The current TIP, which defines federal funding for specific transportation projects and actions over a five-year period, has recorded over 100 TIP actions since it was first adopted in September 2016, NYMTC Executive Director Rivera said. NYMTC’s current staff includes a central staff located in lower Manhattan, and staff in the three satellite offices which serve its three geographically-based Transportation Coordinating Committees (TCC). To respond to local needs, the New York City TCC, the Mid-Hudson South TCC and the Nassau/Suffolk TCC recommend transportation priorities and provide additional opportunities for interested stakeholders to become involved in the planning process. The next PFAC meeting is scheduled for Thursday, January 18, 2018 at 12:15 p.m.
NEW YORK – The Metropolitan Area Planning (MAP) Forum held the first meeting of its newly formed Multi-State Freight Working Group on Wednesday November 1, 2017 at the New York Metropolitan Transportation Council (NYMTC). The meeting, which was held at NYMTC's office in downtown Manhattan, featured a presentation by the Port Authority of New York and New Jersey on its just initiated Port Master Plan development initiative. Additionally, the North Jersey Transportation Planning Authority (NJTPA) discussed how New Jersey is a major distribution state for the region. Participating metropolitan planning organizations (MPOs) and state department of transportations (DOTs) also provided updates on freight planning activities in their areas. Steve Brown, Manager of Regional Transportation at the Port Authority of New York & New Jersey, provided a presentation on the Master Plan for the Port of New and New Jersey: A Road Map for the Next 30 Years. NEW YORK -As thousands of families walk to school this October as part of International Walk to School Month, new data from the New York Metropolitan Transportation Council (NYMTC) finds that streets are now safer in New York City and its surrounding counties. Offering a very interesting picture into the overall safety of the New York metropolitan area’s transportation system, the 2015 Regional Transportation Statistical Report dives into key figures related to accidents involving pedestrians, bicyclists and motor vehicles over a 10-year period that concluded in 2015. Within New York City, fatal pedestrian crashes continued to decrease to approximately 130 accidents in 2014 after recording an all-time high in 2013 for the period (See Figure 1). Also, motor vehicle crashes continued to trend downward in the five boroughs (See Figure 2). For instance, in 2015, there were 61,106 crashes, which was approximately 18,000 below the reported crashes in 2007 and nearly 5,000 below the reported crashes in 2014. Additionally, from 2013 to 2015, New York City experienced a decline of approximately 800 fatal and injury crashes that involved bicycle riders and motor vehicles (See Figure 3). Meanwhile, New York’s suburban counties (Dutchess, Nassau, Orange, Putnam, Rockland, Suffolk and Westchester Counties) saw fatal crashes involving pedestrians (See Figure 1) and motor vehicle crashes (See Figure 2) increase. However, fatal and injury crashes involving bicyclists and motor vehicles (See Figure 3) experienced a steady decline over the 10-year period prior to 2015’s low of 965 reported incidents. Focused on improving the region’s transportation system for the future, Plan 2045 – NYMTC’s current Regional Transportation Plan – features safety as a regional goal that is paramount to the transportation planning process. The Regional Transportation Statistical Report includes key statistics, which serve as a report card on the overall region’s performance toward achieving mobility and safety objectives. Efforts have been in place at the local and state level to implement safety improvements and raise community awareness within NYMTC’s planning region. Previously, New York City launched “Vision Zero” in 2014 to eliminate traffic fatalities. Also, there are programs like “Safety City” that work to teach New York City school children about traffic safety. Other similar programs include the New York City Department of Transportation’s (NYC DOT) “We’re Walking Here” initiative, which invites students to discuss ways to change our behavior on the streets in order to lower traffic fatalities and injuries. Additionally, the Safe Routes to School (SRTR) program – a federal, state and local effort supported by the New York State Department of Transportation (NYSDOT) and other NYMTC member agencies – seeks to assist New York communities in developing and implementing projects and programs that encourage walking and bicycling to school while enhancing overall safety. As listed in NYMTC’s Regional Transportation Plan, pedestrian safety efforts – led by its member agencies – have focused on all age groups and populations. For instance, New York City’s “Safe-Streets-for-Seniors” program – a pedestrian safety initiative for New York City’s older residents – and NYSDOT’s “Safe Seniors” pilot program in Long Island seek to educate and inform our region’s seniors. Within NYMTC’s 10-county planning region, there are similar programs that aim to encourage the safe travel of pedestrians, bicyclists and motorists (See Chapter 5: Transportation System Management & Operations). Also, information regarding initiatives to enhance the region’s pedestrian and bicycle transportation system can be found in the Pedestrian and Bicycle Element of Plan 2045. For more information, please view the Regional Transportation Statistical Report here. NEW YORK - During its September 28 meeting, members of the New York Metropolitan Transportation Council’s (NYMTC) Program, Finance and Administration Committee (PFAC) heard a special presentation from Kamran Saddique, founder and executive director of the City Innovate Foundation. The presentation discussed how the City Innovate Foundation is utilizing open innovation and data – through its Urban Mobility Playbook and Collider Program – to help transportation officials, city agencies and public sector leaders to identify transportation and mobility challenges. “As regions continue to cope with their changing transportation needs, especially in the New York metropolitan area, I am excited to hear more about how the City Innovate Foundation is improving urban mobility through collaboration amongst the public and private sector,” NYMTC Executive Director Rivera continued. In addressing PFAC members and the public, Mr. Saddique said that the public, private, academic and nonprofit sectors need to “build a data collaborative” in order to achieve long-range transportation planning goals. “Technology and data are going to help us make better informed decisions, but that’s not enough; we need to change the way we think and work,” he added. While explaining that City Innovate’s Collider Program is helping to collaboratively identify issues in Florida’s Miami-Dade County and San Francisco, Mr. Saddique said that the Collider Program is a six month, eight workshop program that is to include at least 15 public and private stakeholders. Some prior private partners have included Microsoft, Cubic Transportation Systems, Lyft and MasterCard. “These data are locked in boxes and in silos,” Mr. Saddique highlighted, as he noted how data and information is discovered, documented and shared through the Collider Program. The goal of the Collider Program is to find solutions and best practices that are then recorded in its Urban Mobility Playbook. The Playbook documents lessons learned that include relevant data, collaborative ideas and information from both public and private sectors that can help to address regional transportations challenges. “Cities trust other cities in learning about best practices,” he added. • Amendments to the State Fiscal Years (SFYs) 2017-2018 Unified Planning Work Program (UPWP). The next PFAC meeting is scheduled for Thursday, November 16 at 12:15 p.m.
NEW YORK - Public transit ridership, use of ferries and the sheer number of vehicles crossing New York’s waterways blew past prior heights, according to new data from the New York Metropolitan Transportation Council (NYMTC). NYMTC’s new report highlights growth for employment (1.51%) and population (0.56%) for New York, New Jersey and Connecticut in 2015 (see Figure 1). For New York City alone, population increases ballooned to approximately 8.4 million, which was higher than any other year over the past decade. Similarly, for the multi-state metropolitan area, population figures reached nearly 21.1 million in 2015. All the while, the unemployment rate dipped to 8.1%, according to the U.S. Census Bureau’s American Community Survey (ACS) - the lowest unemployment rate for the region since the Great Recession. However, the Regional Transportation Statistical Report does highlight public transit trips decreased by 1.74% in 2015 following a record high ridership year in 2014. At that time, approximately 2.8 billion unlinked passenger trips were taken on the subway and 184.5 million trips were reported on the Metropolitan Transportation Authority’s (MTA) Long Island Rail Road and Metro-North Railroad – a bellwether year that surpassed the prior decade. When looking further into the data, the MTA reported increases in overall ridership to 1.76 billion for New York City Transit in 2015. Also, millions of more people turned to our trusted waterways to get around daily. Unlinked passenger trips for the Staten Island Ferry – run by the New York City Department of Transportation – and private ferries showed a continued uptick in usage in New York and New Jersey in 2015. Specifically, there were nearly 1.6 million more trips reported on the Staten Island Ferry and private ferries in 2015, with each service reporting an 800,000 increase in annual unlinked passenger trips when compared to the prior year. Over the same period, overall traffic volume for bridge and tunnel crossings increased by nearly 2% in 2015 in the multi-state metropolitan region. One reason for this may be the reported historical surge in new registered motor vehicles in New York’s study counties to nearly 5.9 million (See Figure 2), indicating that 90% of these registrations were registered for personal use in 2015. The Regional Transportation Statistical Report includes key statistics, which serve as a report card on the overall region’s performance toward achieving the mobility and safety goals outlined in NYMTC’s Regional Transportation Plan. Recently, NYMTC adopted Plan 2045, its current Regional Transportation Plan, where numerous projections are utilized to effectively plan for the transportation system. NYMTC uses the New York Best Practice Model (NYBPM), a travel demand forecasting model that helps with transportation planning. NEW YORK - The New York Metropolitan Transportation Council (NYMTC) adopted Plan 2045 – its next Regional Transportation Plan and shared vision for the future. With a focus on sustainability, Plan 2045 covers the long-range goals, objectives and needs for the transportation system that connects New York City, Long Island and the lower Hudson Valley. Why is Plan 2045 needed? NYMTC’s planning area is projected to grow in population from 12 million to 14.3 million by 2045, which will increase overall usage of our transportation system. The current transportation system already bears the load of millions of daily passenger trips by bus, rail rapid transit, commuter rail, ferries and private vehicles, as well as millions of tons of freight moving by truck, rail and water. As a result, the Regional Transportation Plan contains numerous system preservation and system enhancements such as the Lower Hudson Transit Link, the Moynihan Station in New York City and the Nassau Hub Transit Initiative. Themed “Maintaining the Vision for a Sustainable Region,” Plan 2045 covers overall transportation planning in NYMTC’s planning area over the next quarter century. Plan 2045 encompasses all facets of transportation - including roads, bridges, mass transit facilities, bicycle and pedestrian networks, goods movement and transportation for those with special needs. Adoption of Plan 2045 includes approval of its accompanying planning processes that are required to qualify for federal transportation funding. These include the 2017 Congestion Management Process (CMP) Status Report and the Transportation Conformity Determination. The CMP forecasts future traffic congestion and considers strategies that reduce overall congestion in the region going forward. Also, the Transportation Conformity Determination quantitatively demonstrates how Plan 2045 and the Transportation Improvement Program (TIP), which helps to define specific transportation projects over a five-year period, can impact future mobile source emissions. NEW YORK – With the help of the University Transportation Research Center (UTRC), the New York Metropolitan Transportation Council (NYMTC) hosted a Metropolitan Planning Organization (MPO) Peer Exchange meeting, which included MPOs from Northern Illinois, the Greater Philadelphia Region, the San Francisco Bay Area and Northern New Jersey. NYMTC Executive Director Jose M. Rivera, along with members of NYMTC’s Program, Finance, and Administration Committee (PFAC) participated in a lively discussion regarding MPO critical issues, funding, operations and challenges. Member agency representatives – as delegated by the Council – make up PFAC, which is responsible for overseeing NYMTC’s day-to-day activities. The Region 2 UTRC, which served as organizer and moderator for the MPO peer exchange discussion, is one of ten original University Transportation Centers established in 1987 by the U.S. Congress. These Centers were established with the recognition that transportation plays a key role in the nation's economy and the quality of life of its citizens. The UTRC represents United States Department of Transportation Region II, including New York, New Jersey, Puerto Rico and the U.S. Virgin Islands. NEW YORK - During its April 20 meeting, members of the New York Metropolitan Transportation Council's (NYMTC) Program, Finance, and Administration Committee (PFAC) heard a special presentation from Michael Evans, president of the Moynihan Station Development Project. The presentation discussed the future of Moynihan Station - including upcoming improvement plans to connect the historic James A. Farley Post Office with Penn Station, one of the busiest transit hubs in the country. The project can be traced back to first conception more than 25 years earlier and is named after late U.S. Senator Daniel Patrick "Pat" Moynihan. It is a multi-phase plan to transform the landmarked Post Office building into the new Manhattan home for Amtrak. Mr. Evans highlighted to PFAC members and the general public that real construction has already started in creating the great Train Hall. Because Penn Station is currently at full capacity, with over 700,000 plus daily riders and 1,200 trains daily, Mr. Evans noted that "it is the busiest transportation node in the Western Hemisphere," with two of the busiest commuter railroads (Long Island Rail Road and New Jersey Transit) and two of the busiest subway stations. "What is so incredible about this project is we are going to take 100-year-old infrastructure, a beautiful historic gem and adaptably reuse it to solve a 21st century problem and create a 21st century transportation facility," Mr. Evan said during the April 20 PFAC meeting. He added that this new Farley solution will help to alleviate the congestion at Penn Station and address the incredible surge in growth of the Far West Side of Manhattan. Both Amtrak and LIRR will utilize the Moynihan Station - including plans by Amtrak to move all passenger facing to the new facility (i.e. ticket information, baggage handling, etc.) that will connect Midtown to the Far West Side. The Farley building will increase concourse space by 50 percent and increase vertical circulation of passengers. Moynihan Station Project - Phase 1: Expanded West End Concourse, Vertical Circulation, new entrances/connections. Moynihan Station Project - Phase 2: Taking courtyard of original Farley building - initially used for all mail sort of the Post Office building, and build a three-story atrium space for LIRR and Amtrak. Also, the Grand Train Hall will maintain prior historic trusses and incorporate a skylight system for added natural light to the transportation facility. Projected timeline for the project, valued at appropriately $1.594 billion, includes an expected completion by 2020. Amendments to the State Fiscal Years (SFYs) 2016-2018 Unified Planning Work Program (UPWP) passed, which included a motion for adjustments to various projects NYMTC staff and its member agencies are currently carrying out in their SFY 2017-2018 UPWP. The modification included a project sponsored by the New York City Department of Transportation and projects sponsored by the Port Authority of New York and New Jersey that do not require any new funding for completion. The UPWP helps to determine how federal funding for planning activities will be spent over the course of a program year. Adopted amendments to the Vision and Pedestrian Elements-Bicycle Elements of the Fiscal Years 2014-2040 Regional Transportation Plan: adding four project concepts - the Replacement of the Grand Street Bridge over the Newtown Creek; the Arthur E. Sheridan Expressway Enhancement Project; the Expansion of the Weigh-in-Motion Program; and the Expansion of the Clean Vehicle Program will be included to the vision element of Plan 2040, NYMTC's prior regional transportation plan. Also, the South Bronx Greenway along the Bruckner Boulevard project will be added the Pedestrian-Bicycle Element of Plan 2040 to show the New York City Department of Transportation as a co-sponsor, along with the New York City Economic Development Corporation. Adopted resolution for the Arthur E. Sheridan Expressway, currently classified as an inter-state, to be classified as a principal arterial roadway due to the fact than an arterial road or arterial thoroughfare is a high-capacity urban road whose primary function is to deliver traffic from collector roads to freeways or expressways. Also, NYMTC Staff offered a recap of the planned Public Review of Plan 2045 - Federal regulations require that NYMTC update its regional transportation plan (RTP) every four years. As a result, a new plan is required by Oct. 1 2017. Following the hard work of members and staff, and input from the public, NYMTC is close to having a draft plan to be presented. "Plan 2045, which we are labeling as 'Maintaining the Vision for a Sustainable Region,' covers the Federal Fiscal Years 2018-2045 and builds on the progress made in the past Regional Transportation Plan 2040. Our Regional Transportation Plan covers all facets of transportation - including roadways, public transportation, bicycles, pedestrians and transportation for those with special needs," said NYMTC Executive Director Jose M. Rivera. "NYMTC's planning area is slated to grow to 14.3 million by 2045; it is essential that the programs and projects in Plan 2045 continue to move forward in order to maintain our existing infrastructure in a state of good repair and address long-range transportation needs," Executive Director Rivera continued. Starting in May, there will be a 30-day mandatory public comment for the draft Plan 2045, the Congestion Management Process and Transportation Conformity. In total 10 in-person meetings are planned across the NYMTC planning area - including Putnam County, Westchester County, New York City, Suffolk County and Nassau County. The New York City meetings will be available as webinars as well. Public comment will also be available at https://nymtc.mysidewalk.com/. The final Draft Plan 2045 will come to a vote to the PFAC and Council Members on June 27 and June 29, respectively. NYMTC’s Freight Transportation Working Group meeting on March 21st featured a presentation on the Metropolitan Resilience Network, which is hosted by the International Center for Enterprise Awareness . The Network’s mission is to advance resilience by bringing together public and private stakeholders to collaborate on shared operational risks to their organizations and to the wider region. In pursuit of this mission, the Network connects existing risk, security, continuity and crisis efforts; provides a platform for on-going risk communications; and offers both joint exercises and a best practice knowledge base. Bill Raisch, the Network’s Director, provided an overview presentation on the Network and its activities. The meeting also featured a discussion of the drafting of NYMTC’s new Regional Freight Plan and updates on related freight planning activities in the region, including New York State DOT’s new Freight Plan, New York City DOT’s Smart Truck Management Plan, and New York City Emergency Management’s Regional Resiliency Assessment Program. Lastly, Alycia Gilde of CALSTART announced the start of the New York Truck-Voucher Incentive Program, which provides voucher incentives for the purchase of all electric, hybrid and CNG vehicles and diesel emissions control technologies. NYMTC-Notes, produced monthly, includes information about NYMTC's activities and events in the region. 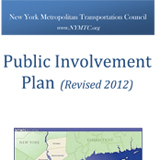 The PIP guides NYMTC's ongoing public our each efforts in the region. A comprehensive look at NYMTC's activities over the previous year. NYMTC's Language Access Program provides translations of NYMTC's core planning products and analyses - the Regional Transportation Plan, TIP and related Annual Listing of Obligated Projects, UPWP, CMP Conformity Determination and Public Involvement Plan. You can also request translation services for meetings by contacting us 72 hours in advance.